Guilty Feminist, FairPlé, Hannah Peel, Alana Henderson, Queen Zee, Brigid O’Neill and more set for Women’s Work. The Oh Yeah Music Centre has announced the details of its fourth Women’s Work programme. 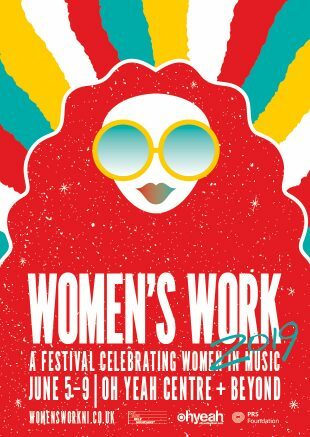 The festival, which is an annual celebration of women in music, will take place across five days and nights and includes a range of activities that are open to all genders and include showcases, gigs, special events, panels, talks, and workshops. One of the highlights for 2019 includes the Belfast debut of The Guilty Feminist. The award winning Podcast presented by Deborah Frances-White will be recorded live at the Limelight 1 on Saturday 8th June. The festival also involves shows from Alana Henderson at the Strand, a Start Together party with Queen Zee at the Limelight 2, and Hannah Peel will be taking part in the Oh Yeah Getting To Know series. Derry author Geraldine Quigley of ‘Music Love Drugs War’ will be talking to Women Aloud. Weather permitting, Brigid O’Neill is this years’ intimate rooftop artist at Oh Yeah, and Bird & Bramble is paying tribute to Blondie. There’s a screening of Bad Reputation, which documents the story of Joan Jett, and there’s a women of Irish Hip Hop night presented by Elixer. The programme is busy and there’s also the annual Women’s Work Showcase to look forward to. This event will play host to the freshest new sounds from the likes of Wynona Bleach, Molly Sterling, DENA, Gemma Bradley, Gender Chores and more! “Belfast boasts a vibrant and diverse music scene that everyone can be proud of. Our reputation for developing world- class talent continues to grow from strength to strength and the contribution women make to that success cannot be underestimated. The Festival runs 5th – 9th June. A fresh new website goes live on April 11th.